This past August, scientists working with CERN's ALICE (a Large Ion Collider Experiment), a heavy-ion detector on the Large Hadron Collider (LHC) ring, made precise measurements of particle mass and electric charge that confirm the existence of a fundamental symmetry in nature. "After the Big Bang, for every particle of matter an antiparticle was created. In particle physics, a very important question is whether all the laws of physics display a specific kind of symmetry known as CPT, and these measurements suggest that there is indeed a fundamental symmetry between nuclei and antinuclei," said Marcelo Gameiro Munhoz, a professor at the University of São Paulo (USP). ALICE is one of the largest experiments in the world devoted to research in the physics of matter at an infinitely small scale. Hosted at CERN, the European Laboratory for Nuclear Research, this project involves an international collaboration of more than 1500 physicists, engineers and technicians, including around 350 graduate students, from 154 physics institutes in 37 countries across the world. The ALICE Experiment is going in search of answers to fundamental questions, using the extraordinary tools provided by the LHC: What happens to matter when it is heated to 100,000 times the temperature at the centre of the Sun ? Why do protons and neutrons weigh 100 times more than the quarks they are made of?Can the quarks inside the protons and neutrons be freed? The findings, reported in a paper published online in Nature Physics led the researchers to confirm a fundamental symmetry between the nuclei of the particles and their antiparticles in terms of charge, parity and time (CPT). These measurements of particles produced in high-energy collisions of heavy ions in the LHC were made possible by the ALICE experiment's high-precision tracking and identification capabilities, as part of an investigation designed to detect subtle differences between the ways in which protons and neutrons join in nuclei while their antiparticles form antinuclei. Munhoz is the principal investigator for the research project "High-energy nuclear physics at RHIC and LHC", supported by São Paulo Research Foundation (FAPESP). The project–a collaboration between the Relativistic Heavy Ion Collider (RHIC) at Brookhaven National Laboratory in the United States and ALICE at the LHC, operated by the European Organization for Nuclear Research (CERN) in Switzerland–consists of experimental activities relating to the study of relativistic heavy-ion collisions. Among other objectives, the Brazilian researchers involved with ALICE seek to understand the production of heavy quarks (charm and bottom quarks) based on the measurement of electrons using an electromagnetic calorimeter and, more recently, Sampa, a microchip developed in Brazil to study rarer phenomena arising from heavy-ion collisions in the LHC. According to Munhoz, the measurements of mass and charge performed in the symmetry experiment, combined with other studies, will help physicists to determine which of the many theories on the fundamental laws of the universe is most plausible. "These laws describe the nature of all matter interactions," he said, "so it's important to know that physical interactions aren't changed by particle charge reversal, parity transformation, reflections of spatial coordinates and time inversion. The key question is whether the laws of physics remain the same under such conditions." In particular, the researchers measured the mass-over-charge ratio differences for deuterons, consisting of a proton and a neutron, and antideuterons, as well as for nuclei of helium-3, comprising two protons and one neutron, and antihelium-3. Recent measurements at CERN compared the same properties of protons and antiprotons at high resolution. 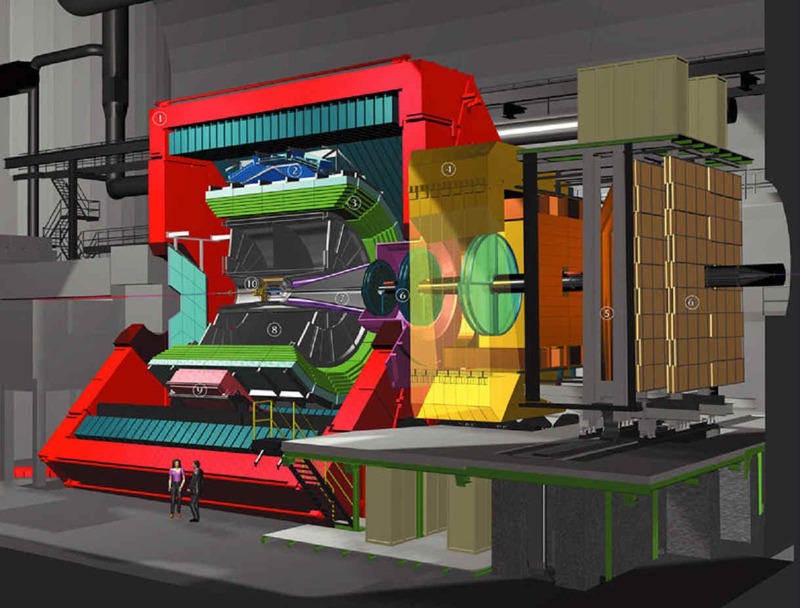 The ALICE experiment records high-energy collisions of lead ions at the LHC, enabling the study of matter at extremely high temperatures and densities. The lead-ion collisions provide an abundant source of particles and antiparticles, producing nuclei and the corresponding antinuclei at nearly equal rates. This allows ALICE to make a detailed comparison of the properties of the nuclei and antinuclei that are most copiously produced. The experiment makes precise measurements of both the curvature of particle tracks in the detector's magnetic field and the particles' time of flight and uses this information to determine the mass-to-charge ratios for nuclei and antinuclei. The high precision of the time-of-flight detector, which determines the arrival time of particles and antiparticles with a resolution of 80 picoseconds and is associated with the energy-loss measurement provided by the time-projection chamber, allows the scientists involved to measure a clear signal for deuterons/antideuterons and helium-3/antihelium-3, the particles studied in the similarity experiment. The image at the top of the page is an artist's conception that illustrates the history of the cosmos, from the Big Bang and the recombination epoch that created the microwave background, through the formation of galactic superclusters and galaxies themselves. The dramatic flaring at right emphasizes that the universe's expansion currently is speeding up.